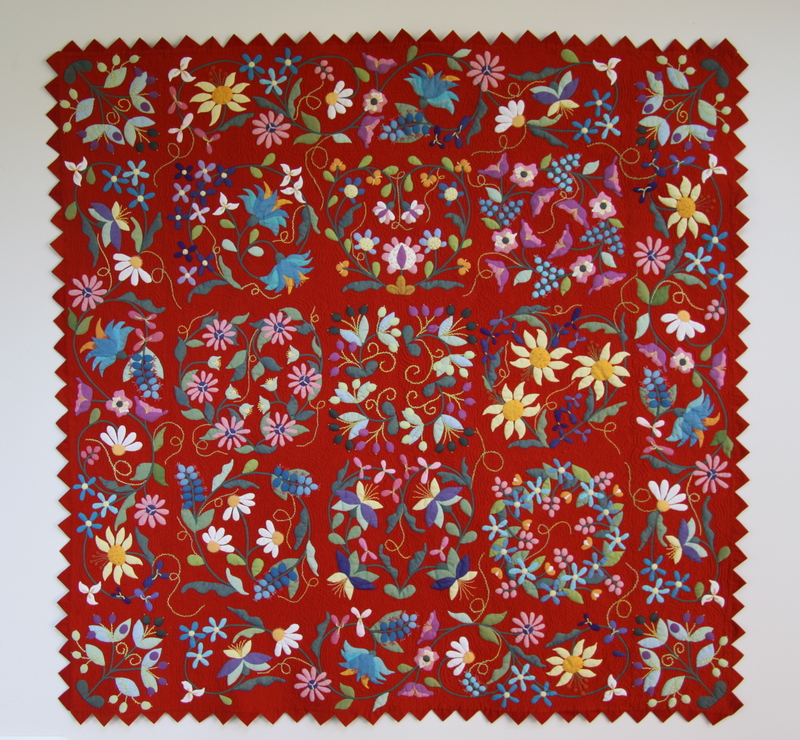 I am back to sewing after quite a break from needle and thread. 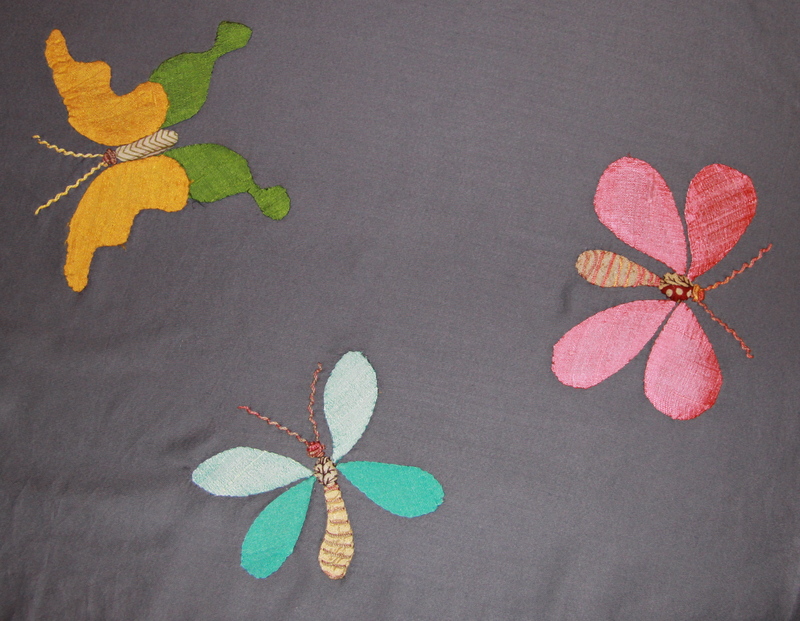 I am breaking myself back in gently with some insects scattered on a wholecloth. I’m enjoying fiddling around with little bits and pieces of silk again, embroidery thread and random colours. It’s not exactly a magnum opus but it’s getting me back in my groove. My eye is still a bit squiffy to say the least but I have decided to make friends with the large jellyfish like creature that floats across my vision every few minutes, closely followed by what looks like an octopus and other life forms more suited to an aquarium. I have been told that this debris can take weeks/months to clear and so making friends with it rather than continuous exasperation seems a better way to go. I came home from the school run to an unexpected package from UPS. 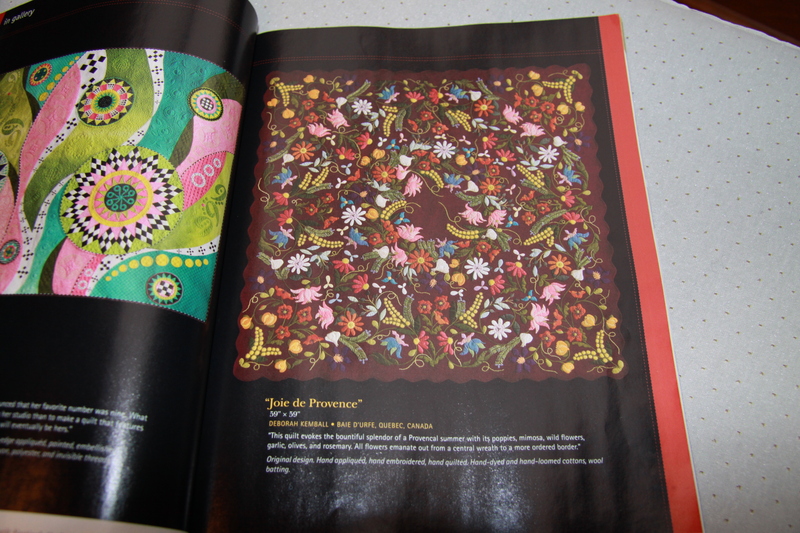 The International Quilt Festival (Houston Quilt Mecca, starting tomorrow) asked me weeks ago if they might have permission to photograph my quilt with a possibility of putting it in their annual magazine to coincide with the festival. 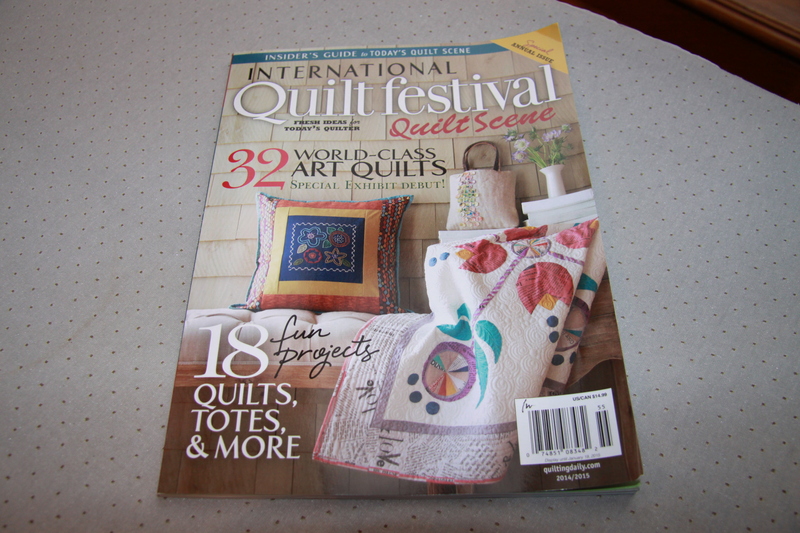 They said they would send me a free copy if my quilt was included. And there it was. My bête noire! And meanwhile over the past ten days I finished my “Torn Retina Sweater”. Started just before my accident. I love how soft it is, light as a feather and just as soft as can be. I used Brooklyn Tweed Loft from left over from Pente hence the same colour scheme. 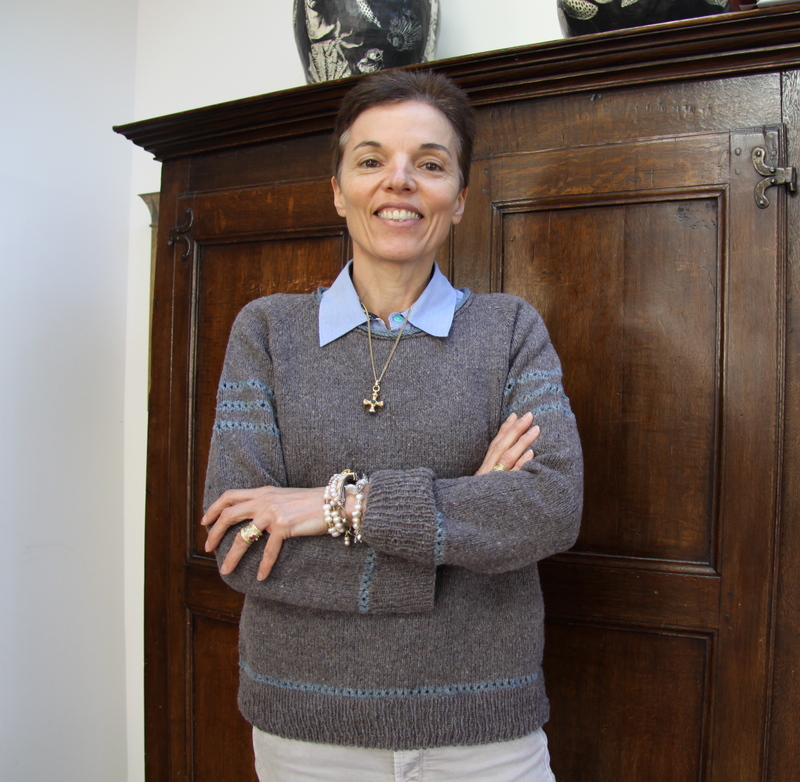 Dreadful photo of me taken this morning (unable to dye my hair with my eye problem ha ha) but lovely jumper. The bottom was cast on with tubular cast on which I have never done before and it was worth the extra time. I love it. By the time I got to the sleeve cast on I was seriously visually impaired and I knew I couldn’t manage the Tubular so I did my conventional 1p1k rib and as you can see it is nothing like as beautiful as the slightly picot edge of the tubular cast on at the body edge. I think the point of tubular cast on is its stretch but I didn’t think it would look so lovely. “Elmont” knitted in Brooklyn Tweed Loft. Designed by Julie Hoover. Pattern on Ravelry.